The designations employed and the presentation of the material in this publication do not imply the expression of any opinion whatsoever on the part of ICRISAT or FAO concerning the legal status of any country, territory, city or area, or of its authorities, or concerning the delimitation of its frontiers or boundaries. Where trade names are used this does not constitute endorsement of or discrimination against any product by ICRISAT or FAO. All rights reserved. 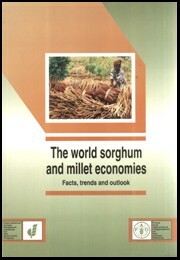 Except for quotations of short passages for the purpose of criticism and review, no part of this publication may be reproduced, stored in retrieval systems, or transmitted in any form or by any means, electronic, mechanical, photocopying, recording, or otherwise, without prior permission from ICRISAT and FAO (the Director, Information Division). Payment is not required for the noncommercial use of ICRISAT/FAO's published works, and it is hoped that this copyright declaration will not diminish the bona fide use of research findings in agricultural research and development. Annex II: Relative importance of millet species, 1992-94.